No cynical jokes about aging action stars here. 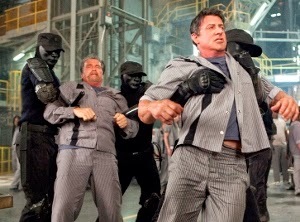 I’ve been unabashedly stoked for Escape Plan ever since this first co-lead teaming of Sylvester Stallone and Arnold Schwarzenegger was announced. We’ve seen them work together, albeit briefly, in The Expendables franchise, but here we get a real buddy picture, with the two titans of ‘80s action sharing ample screen time. Yes, it’s about 25 years too late, but better late than never. That is, provided the movie meets expectations. Those who keep their expectations relatively modest are in for a fun, surprisingly inventive couple of hours. First off, make no mistake: this is ultimately a Stallone vehicle through-and-through. Schwarzenegger doesn’t show up until the second act and even then continues to primarily support Stallone. But the partnership works, especially because Schwarzenegger seems perfectly content not having to carry the picture (as he did with in his lackluster return to starring roles earlier this year in The Last Stand). Both he and Stallone play inmates at a super high-tech, maximum security prison. Stallone is Ray Breslin. It’s hardly a spoiler to say that Ray is paid to break out of prisons in order to expose any security weaknesses. Make that paid very well. After a neat opening breakout sequence where we see Ray casually, cleverly doing what he does best, he’s offered double his normal fee (meaning no less than $5 million) to break out of a “The Tomb.” This prison, filled with cells that look like glass boxes and guards who hide their identity behind spooky black masks, is in an unknown location. Ray’s normal team, headed up by Lester Clark (Vincent D’Onofrio) and supported by strategists Abigail Ross (Amy Ryan) and Hush (Curtis “50 Cent” Jackson), will not be privy to his location. Ray skeptically accepts, but soon regrets it when his implanted tracking device is forcibly removed and he realizes this whole thing was a set-up to put him behind bars for real. Uniting with savvy inmate Emil Rottmayer (Schwarzenegger), Ray begins working feverishly to exploit the Tomb’s weak points. 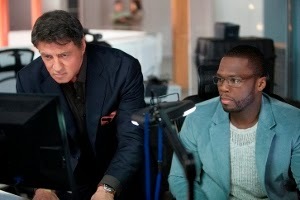 His inventive use of science and Sherlock Holmes-like observation is where most of Escape Plan’s fun lies. 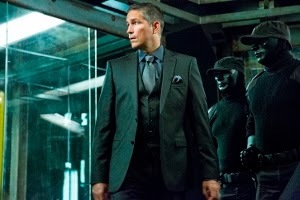 Warden Hobbes (Jim Caviezel) doesn’t know who Ray, going by the codename Porthos, really is. But he’s determined to make Ray’s life hell nonetheless. Sam Neill shows up periodically as a sympathetic doctor, openly accused by Ray of ignoring the Hippocratic Oath. Faran Tahir leaves a strong impression as a Muslim inmate who agrees to work with Ray and Emil. Look, this isn’t a character study. It’s not political or social commentary. It’s a prison break action movie with some cool twists wrapped up in an entertainingly implausible plot. Stallone broods a little too much (recalling his dull characterizations in mid-‘90s fare like The Specialist and Assassins). The Passion of the Christ) is regarded as “the Devil.” But unfortunately the screenplay (by Miles Chapman and Jason Keller, the latter billed as Arnell Jesko) gives absolutely zero backstory for Caviezel’s warden. Again, not a character study – but a few details can go a long way. 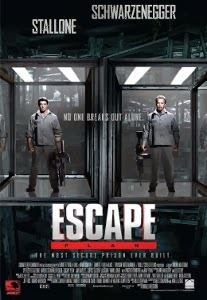 In the end, I had a good time with Escape Plan and felt it delivered more or less what I expected. It’s unlikely to blow anyone away, but those whose appetites were whetted by the fleeting teamwork of Stallone and Schwarzenegger in The Expendables 2 won’t want to miss it.